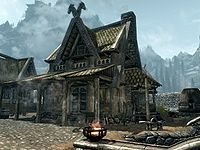 Warmaiden's is a smithy and weapons store in Whiterun. It is located just inside the main gate, right next to Breezehome. The store is owned by Ulfberth War-Bear and his wife Adrianne Avenicci. It consists of one area, Warmaiden's. NOTE: Like all other stores, Warmaiden's has a number of fixed wares on display scattered around the main trading room. These can be bought from the proprietors and will disappear from the room when purchased. For a list of these special items, see this section. During business hours, Adrianne is often smithing in the outside workshop while Ulfberth sells her products inside the store. Both Adrianne and Ulfberth are merchants (see notes), though it is for Adrianne the store was named. Apparently interested in swords even as a child, she received Warmaiden as a nickname from her father. Without the displayed merchandise, the main trading room is completely empty, save for five food sacks scattered around the room. Ulfberth can be found here every day between 8am and 8pm, offering his merchant services. Behind the counter is a door leading to a small dining area with a burning fireplace and a cooking pot. There is also an alternative exit to Whiterun. On the balcony of the second floor is a small table with some sliced goat cheese, right next to the door leading to the bedroom. The bedroom contains a minor loot chest in the northwestern corner and, in the adjacent corner, a dresser with some clothes. On top of the dresser sits the store's business ledger, a locked strongbox, and a plate with a boiled creme treat. The double bed stands at the southern wall with an end table on either side, both with clutter. There is a rare copy of Killing - Before You're Killed on top of one end table and a bottle of ale and a loaf of bread on the other. 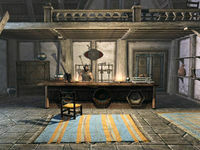 The workshop outside includes a workbench, a tanning rack, a grindstone, a forge and a smelter. The following items are sitting out in the store on counters, shelves, or tables. They can be purchased or taken for free if your Disposition with Adrianne or Ulfberth is high enough. They respawn after ten days. This is the merchandise found in the Warmaiden's merchant chest. These items are only available if purchased from the merchant; they cannot be pickpocketed or stolen. They are restocked every two days. If Adrianne is inside, they share the same merchant chest (essentially the same inventory and gold); however, when outside during business hours, she has a separate merchant chest (independent merchandise and gold). So you can do much more business at the store if you approach each of them individually while Adrianne is outside. You can invest with each of Adrianne and Ulfberth separately if you catch Adrianne outside the shop. After leaving the shop, it may become locked, even during business hours. It will remain locked until you break in, or may unlock itself if you leave the area and come back. If someone notices you picking the lock, it is a crime. However, Ulfberth will act normally and won't accuse you of trespassing, assuming you broke in during the day. Ulfberth may present dialogue that appears to allow for multiple investments, but only the first will count. 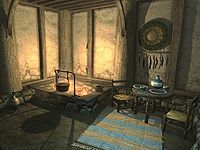 Items sold to Ulfberth are removed from your inventory but gold may not be received. This page was last modified on 12 March 2017, at 12:59.